This was a fun post to write because goodness, there are some creative people out there doing some really cool stuff with their kids. St. Patrick’s Day science? Yeah, man! 1.) Thin Mint Milkshakes — because not only is it St. Patty’s Day this month, around here it’s Girl Scout cookie season! Try a delicious Thin Mint Milkshake, our riff on the Shamrock Shake (though in my opinion, tastier and not a disturbing bright green). 3.) 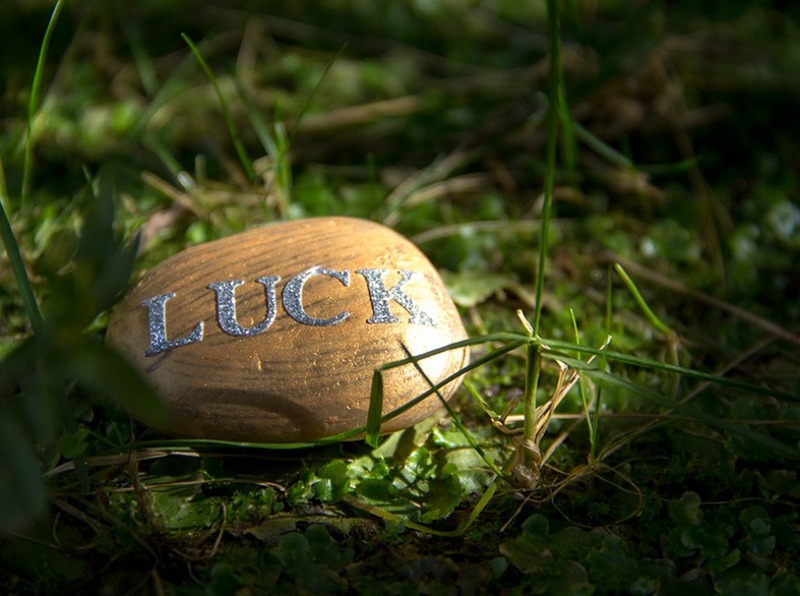 St. Patrick’s Day Scavenger Hunt from Moonfrye — make these rocks for a party, then save them to decorate your fairy garden after. 4.) Leprechaun Fork Beard from Crafty Morning — fork prints! What a great idea…this leprechaun beard is hilarious, and you could use this idea for so many things…lion manes, hair for people you draw. Let your imagination go crazy! 5.) Handprint Rainbow by B-Inspired Mama — ok, both of the things she says here are true: handprint crafts are a dime a dozen. And we mamas are complete suckers for those tiny little handprints on anything and everything ever in the world we don’t even care. Embrace the handprint rainbow. It’s okay. 6.) 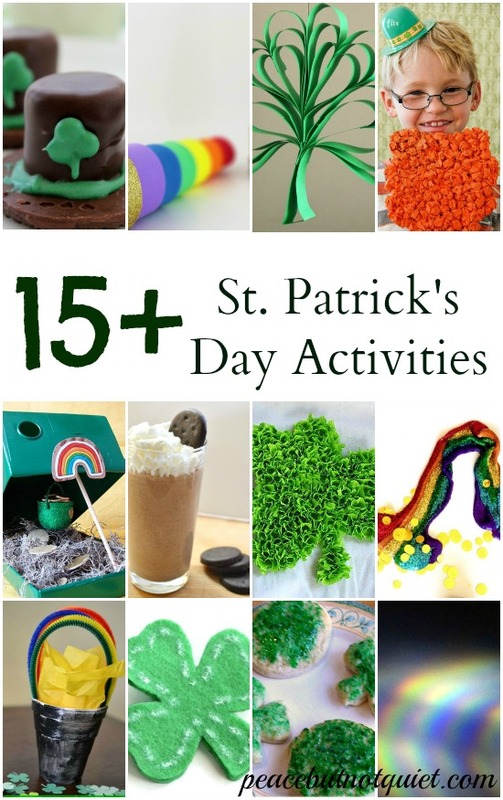 St. Patrick’s Day Cinnamon Rolls by Kids Activities Blog — we have two food traditions every year for St. Patrick’s Day. Corned beef and cabbage for dinner (and my kids eat the cabbage! Why don’t I do this more often?) and some sort of green food, just because it’s fun to dye things green. These cinnamon rolls look fun and tasty, all at once. A great way to kick off the morning. 7.) 3-d Paper Shamrocks by Red Ted Art — this is what I love about shamrocks. I can’t make a shamrock on its own. But a heart? I can make a heart! And a few hearts together make a perfectly good shamrock. Boom. I just shamrocked your world. 8.) St. Patrick’s Day Playdough by Fantastic Fun and Learning — when we had a snow day this week and the kids were all home from school, I made up a batch of playdough and they amused themselves for hours. Such a great tool, playdough. 9.) 3d Tissue Paper Shamrock by Crafts by Amanda — this tissue paper shamrock looks harder than it is. My favorite kind of craft! 10.) St. Patrick’s Day Wreath by Hands on As We Grow — a fun craft that can be modified — made simple for littler kids, and more involved as they get bigger. 12.) Leprechaun Traps by The Crafting Chicks — every St. Patrick’s Day the third graders at school bring in leprechaun traps they’ve made and leave them out, hoping to catch a leprechaun overnight. Somehow the little buggers always elude them, leaving clues and treats behind instead. 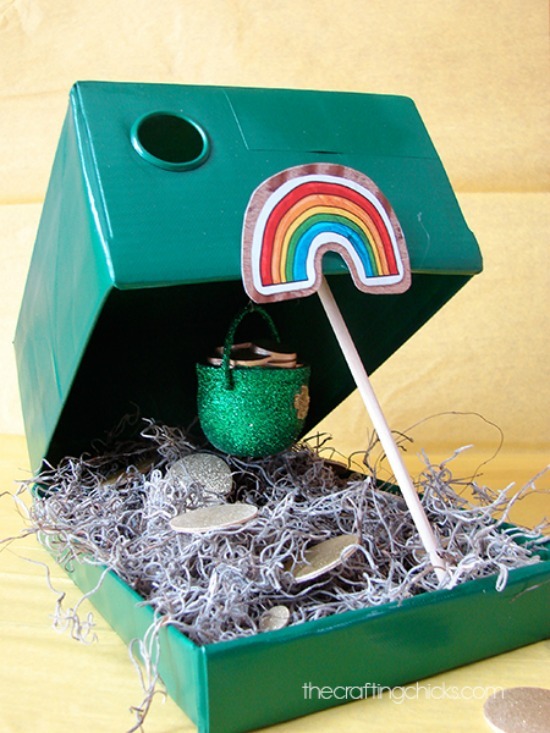 So we’re big fans of leprechaun traps and this one is a cute one! 13.) No-Sew Shamrock Pin by A Night Owl — I can’t. Even. Tell. You. how many times I’ve realized the night of March 16 that I had nothing green or festive to wear in the morning. This pin is cute and simple and you can probably whip it up in about five minutes with stuff you have around the house. Phew! 14.) 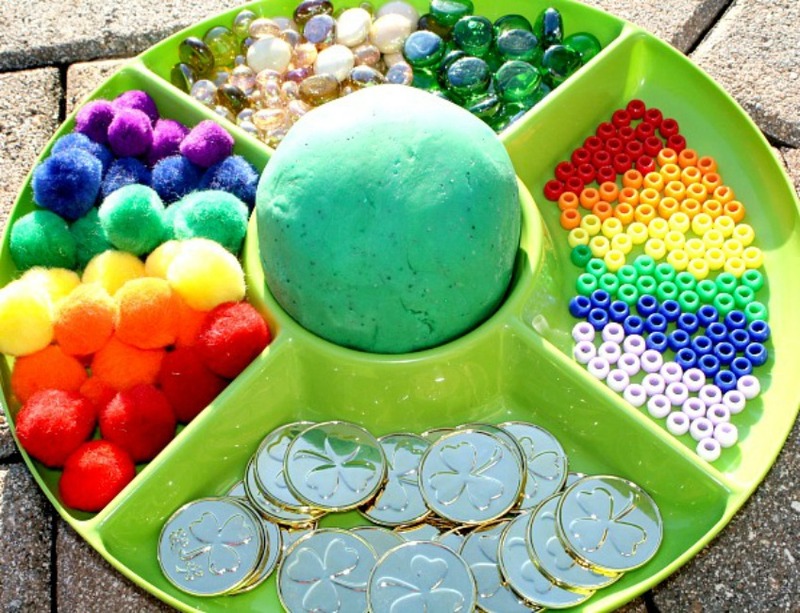 How to Make a Rainbow by Inspiration Laboratories — St. Patrick’s science! Simple instructions to teach kids to make a rainbow. 15.) Rainbow Slime by Left Brain Craft Brain — Oooey gooey colorful fun! 16.) Four Leaf Clover Paper Craft by Meaningful Mama — I love the way this turned out. I’d make it even if I didn’t have kids! 17.) 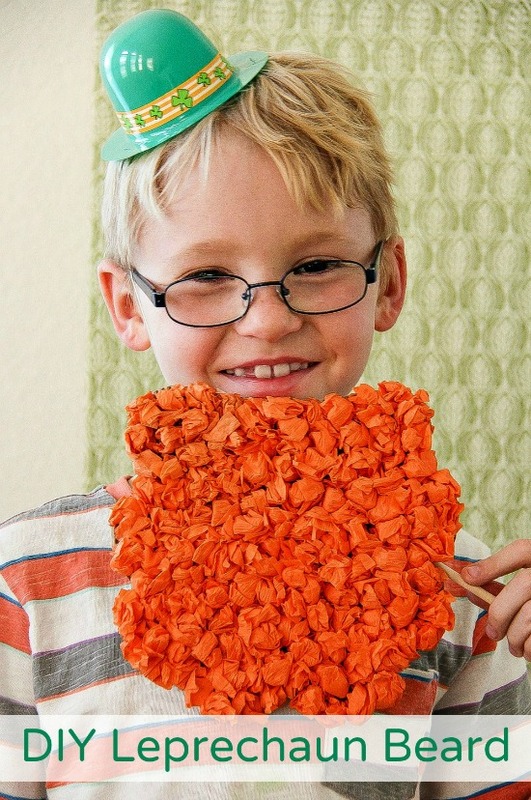 Leprechaun Beard by Divine Lifestyle — kids with beards are just always funny. And they can make this one on their own. 18.) Marshmallow Leprechaun Hats by A Mitten Full of Savings — great for class treats or a party at home. I’d replace the Keebler cookies with Thin Mints because — have I mentioned? — we’re up to our eyeballs in Girl Scout cookies here. Delish!